The danger at these events is, indeed, the Oktoberfest Syndrome, which, although I cannot lay claim to experiencing live, the Travel Channel shows me is not a pretty sight or sound. But we, dear reader, were there for quality, not quantity. Which is why I asked for a taste of the first brew I tried – and, sadly, I suspect it might very well have been the one I should have a had a pint of. 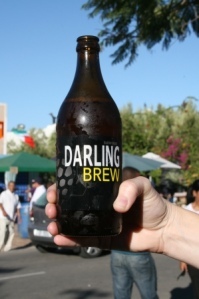 Darling Brew, a quirky name to go with its quirky home, is very fine and very young – eight months young to be precise. And a very tasty youth it is, if you get my drift. Available in 500ml bottles and in a few places on draught, it is well worth seeking out. Call Kevin Wood on 082 889 1175 to find out where you can get it (and he only gets a plug because his website is still under construction: no other reason). Next to Jack Black was Brewers & Union, who have gone into craft brewing in quite a big way. They’ve created a range of seven beers under the auspices of a thing called the Gabriel Collective (not sure of the story there: maybe go ask them, since I failed to). What they do have, their beers, is cool labels and German origins, imported as they are then labelled and marketed here in South Africa. Because they’re imported, they’re not going to be cheap but they will compete head on with other imports – and they will look better in your hand. Sadly, I can’t answer for their taste but we should definitely give them the benefit of the doubt as they are fairly passionate about what they eat and drink at &Union. Check out their website for a lot more detail – better still, visit their Beer Salon at 110 Bree Street and try them out with their charcuterie. Or, if you dare, mail pigandbeer@andunion.com! Beyond Brewers & Union was Mitchell’s Brewery, established way back in 1983 and now South Africa’s most popular microbrewery – or so their publicity says. 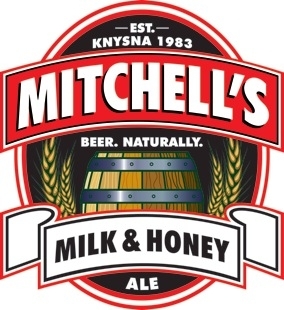 Priding themselves on brewing 100% naturally (no chemicals, no filtration, no pasteurisation), Mitchell’s is a small brewery with a big heart – one big enough to stand up to big, bad SAB and still turn a profit. Like Birkenhead, they produce a range of lagers, ales and stouts, including two available widely on draught, Forester’s Draught Lager and Bosun’s Bitter. And then there’s Milk & Honey Ale, which really does contain honey (and you can taste it) but not Milk. It’s a smooth, sweet ale for those who find bitter just too, well, bitter. And highly recommended. For those who love beer, Paulaner Brauhaus should need little introduction. They’ve been brewing beer on the premises of this devotedly German establishment at the Waterfront for several years – nine to be precise. And their weissbier is magnificent: aromatic, bitter-sweet-sour, delicious. 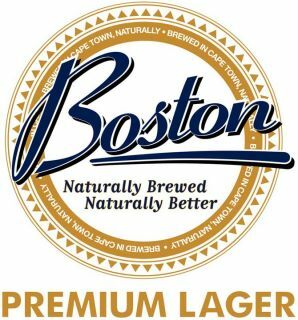 And again, they brew a range of lager-style and dark beers, as well as seasonal brews to suit our Cape climate. Needless to say, the quality of their food is an even match for their beers – you really shouldn’t be drinking wine when you eat there. Next door The Southyeasters, enthusiastic home brewers all, no doubt think that the likes of Boston and Mitchell’s are way too mass production for their liking. These guys are true home enthusiasts and there was a very tasty Golden Ale on their stand. Alas, their website is down so I can’t give you any more information than that – but when it’s up, southyeasters.co.za should give you all the information you need to brew beer of your own. Not uncommon in the UK, doing that (I grew up on a family friend’s very fine bitter), but, one suspects, the province of the dedicated very few here in South Africa. The penultimate brewer at the show was Napier Brewery, which is the result of that apocryphal tale of three friends wanting a better beer to drink and thinking they could and should do it themselves. Only this time they did. Napier’s very own microbrewery now produces a lager, bitter and stout and although I can only answer for their distinctively smoky bitter (not sure how intentional that was, but distinctive it sure made it). Only available in a handful of pubs in and around Napier, this really is a local brew. Maybe, just maybe, this is a sign that local, lekker beer is on the up and up: here’s to a microbrewery in every village! The last stop was a slight impostor as it hailed from Namibia, whose very own Namibian breweries consistently plays the naturally brewed card very heavily – and, indeed, has a strong following in South Africa already, as much for its Rheinheitsgebot credentials as for its flavourful lagers. But lager is all it makes and so Camelthorn, a relatively new entrant into the brewing market at just over a year old (not far behind Darling Brew), has burst onto the market with not one or two but seven different beers. Clearly there’s no messing around here and, indeed, I can vouch for four of the seven, having bought a bottle each of their Weizen, Helles, Red and Fresh beers. The latter is a low alcohol 2.5% brew, the others take their cues from Germany and America in their tastes and styles – but craft style (nothing at this entire festival even approximates the flavourless liquid that is Budweiser or Miller: so sue me?). The upshot of all this beer talk is simply this: you want to drink a beer that tastes of something, where you can distinguish the hops from the barley from the malt from the yeast? Where there is a variety of flavours on offer, rather than just a variety of strengths? Where there are no additives, or preservatives or chemicals of any kind involved in what should be an entirely natural process? Then go no further than any of these august enthusiasts. And they must be onto something because the competition is building and the market is growing with it: supply and demand for a more natural product and a more natural taste. Who said organic was for hippies and sissies?! Blog  Craft beer: should wine be worried?